It’s helpful to remember that professors are people, too. As I was getting ready to leave for college, the most common piece of advice I got from college-educated family members and friends was to talk to my professors. I shrugged it off, assuming that my relationships with professors would come more naturally. Little did I know that in less than two years, I would be giving incoming students the same advice that I was slow to take. I struggled with my mental health in high school, but I was in a pretty good place by the time I started college. So while I talked with my professors occasionally, it was usually about the classes I was in and almost never about my personal life. During my sophomore year, I started struggling with my mental health again and I noticed that it began impacting my success in my classes. I was able to establish a relationship with an off-campus therapist through by connecting with my campus’ Active Minds chapter, but I still felt the need to be open with my professors about the fact that I was struggling. My mental health was not going to resolve itself all at once. I started making appointments with my professors during their office hours. In each one, I admitted that I was struggling with my mental health. The amount of detail that I shared varied depending on the relationship I had with each professor, and some professors more understanding than others, but they all, at the very least, offered to connect me with the counseling center on campus and the office responsible for accommodations. Talking to professors, especially about personal stuff, can be really intimidating, but it’s helpful to remember that professors are people too. They’re as likely as anyone else to empathize with whatever it is you’re going through. Reach out and make an appointment ahead of time. 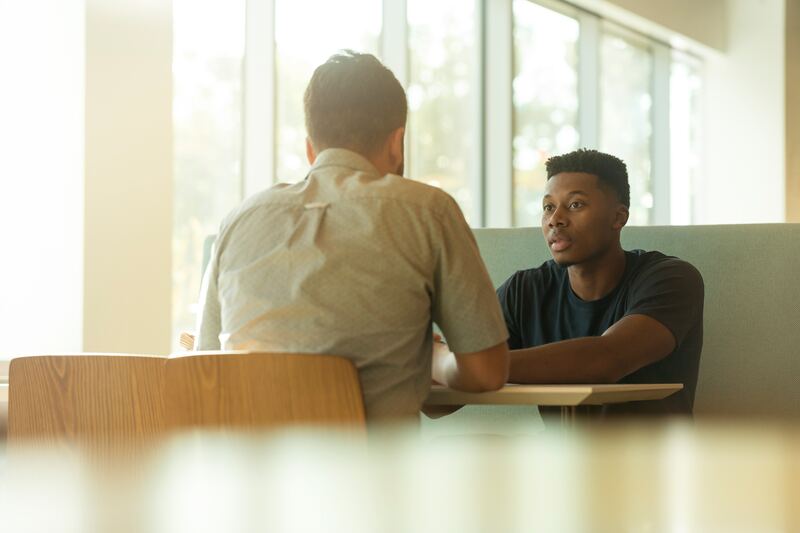 If your professor is expecting you to come in, then you know that you’ll have time to have a conversation with them, and they’ll know that there’s something on your mind — this will make the conversation easier to initiate! Remember that your professor can’t read your mind. A professor might have an inkling that something is going on, but they can’t know for sure unless you talk to them. Only share what you’re comfortable with. If you don’t feel comfortable telling your professor everything, you can simply say that you’re struggling with something in your personal life, and that you’re worried it might be impacting your performance in class- that should be enough to bring the professor up to speed. Be willing to discuss how you can catch up in class, if needed. Part of being honest with your professors is taking accountability if you fell behind in class. If you’re honest about the fact that you’ve been struggling, most professors will be willing to help you create a plan to get caught up. Keep in mind that not every professor will be willing to let you make up everything, but it’s worth it to ask. Ask about resources that are available to you on campus! Especially if you’re new to campus, asking about the resources available to you as a student can be a great step in seeking help when you’re struggling. Professors typically know what offices on campus you could reach out to, even if that amounts to a phone number for the Counseling Center. Keep checking in! Especially if the conversation goes well, it would be good to keep checking in with your professor to let them know if and when things start to improve, or if you need help getting connected with support resources on campus. These are just tips based on my experience as a student — every school is different! However, most of the professors that I know would much prefer to know when a student is struggling, rather than make assumptions about how a student is performing in their class. I have found that being open with my professors about my mental health has improved my success in class, as well as my overall college experience. This type of conversation can be intimidating and scary to initiate, but hopefully these tips will help! Originally published on the Active Minds Blog. Active Minds is a national leader for young adult mental health advocacy and suicide prevention. Headquartered in Washington, D.C., Active Minds brings to mental health what no other organization can — the voice of young people who are disproportionately affected by mental illnesses and the way mental health is addressed on campuses and in society at large.